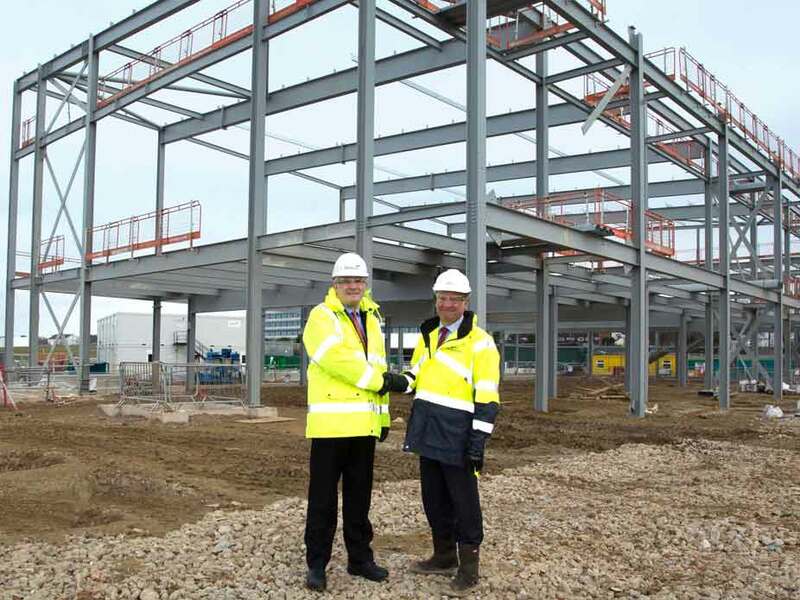 Building work on the new Hall 1 at Farnborough International’s new Exhibition and Conference Centre is progressing as main contractor, Wates Construction, begins with the venue’s 1,300-tonne steel frame. The progress on-site follows Wates’ appointment to deliver the £30m build contract last year, which will see the creation of a new purpose-built exhibition and conference facility at the historic home of the world-renowned Farnborough International Airshow. The development will include a 12,480sqm main hall as well as conference and function space, bringing the total floor area to a total of 20,000sqm – the equivalent of 16 Olympic swimming pools. Commissioned to support Farnborough International’s expansion strategy, the scheme has been funded with loans from a unique consortium of lenders including the Local Enterprise Partnership, Enterprise M3, Hampshire County Council, Rushmoor Borough Council and Barclays. Throughout construction, the Wates team will be made up of 180 operatives during peak periods, with 220,000 man-hours going into the build. Completion of the new development is scheduled for February 2018. Wates has also made a pledge to create opportunities for local employment and training, including the provision of 490 on-site training weeks and the appointment of local supply chain partners. Andrew Davies, chief executive of the Wates Group, said: “On all of our projects we make a commitment to use our on-site presence to invest in the next generation workforce and our delivery of the new Exhibition and Conference Centre will see new careers take off for local people. Merlin Entertainments have big plans at the NEC! Great view from one of our recent exhibition builds in Cannes! Lovely feedback from one of our clients! Blueprint displays are a full service exhibition stand design and build contractor; building modular stands in locations worldwide. We design, construct, transport, install and also store your exhibition stand for future stands or exhibitions. Blueprint Displays Limited. All rights reserved. Website by Digital Storm.